I have an old primary school class black and white photo which I would like to convert to colour. It will be great for my whole class to see the good old day in colour! How can I select a colour A (shirt) and then change all images with colour A to another colour? Any other tips on B & W conversion to colour will be most welcome. P/S Tried one apps to convert B&W to colour. Result is disappointing, not much change in the colouring. (04-08-2019, 01:04 PM)plumbergp Wrote: I have an old primary school class black and white photo which I would like to convert to colour. The hand-tinted picture was dirty and damaged, so I started fresh by scanning the B/W print and repairing the damage, then I colorized the base image to a gentle sepia. (Hand-tinted portraits have warmer, truer tones on a sepia base, and the same seems to be true of digital tinting.) The next step with hand-tinting is to swab on thin layers of oil paint in the desired colors. Mistakes are easily removed while the paint is fresh by wiping with turpentine. The digital equivalent is to use a paintbrush in Overlay mode. I made a separate layer for each color. As I recall, I used a combination of selection/bucket fill, a paintbrush for small areas, and erasing for tidying up. 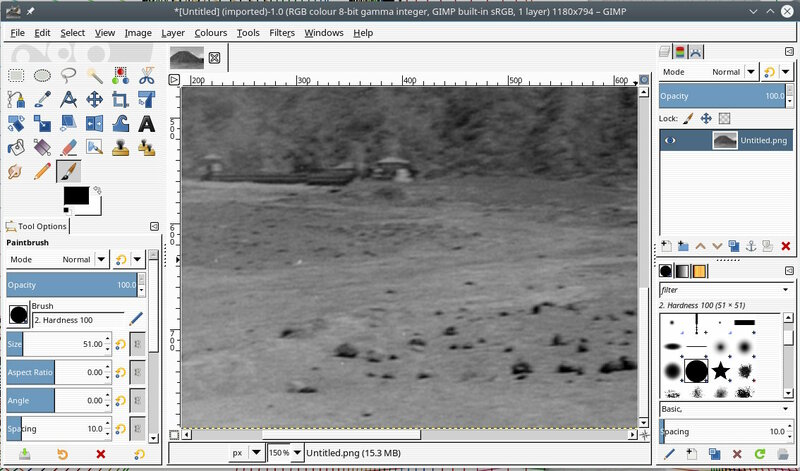 As I look at my final result right now, I see that my colors aren't exactly the same as the original tinted photo. That may partly be due to the challenge of getting the color right in overlay mode. That takes trial and error. What you see in the foreground color sample is not what you get on the photo. But also, compared to my memory of them, those clothes were seriously faded in the original and the headscarf too yellow, so I corrected for that. Were I to start again on this file, I'd deepen the skin tone (I may have left that sepia skin bare), add a tinge more yellow to the scarf, and dab more cyan in the sky. But since I no longer have access to Photoshop to open the file with all the layers intact, it's going to remain as it is. I can't see a clear advantage in either method, mine or the one in the previous tutorial. Results seem comparable. This does take time, but it can be an absorbing task with rewarding results. Give it a try! Yes, lots of work. A GIMP learning journey for me and also to bring smiles to all my primary school classmates. About 50 classmates and 15 teachers in there to work on. Noted and thanks for sharing! Will use some of your tips when I work on the photo. I told my ex classmates that I will have it ready this week. Gee, now more like this quarter! Ha. Some time ago I wrote a tutorial on colouring photographs. I don't know if it will help you, but here it is. The main advantage of this method may be that the selections are saved as channels, making it easier to make subsequent adjustments and corrections. However, it is a time-consuming process whichever method you use! That last tutorial is almost exactly the process I followed, though I colorized my photo to sepia before beginning to select and paint. Thanks for the link to it! (04-09-2019, 10:09 AM)david Wrote: Some time ago I wrote a tutorial on colouring photographs. I don't know if it will help you, but here it is. The main advantage of this method may be that the selections are saved as channels, making it easier to make subsequent adjustments and corrections. Looks like busy but fun time in the task ahead! Trying out the steps in adding colors. 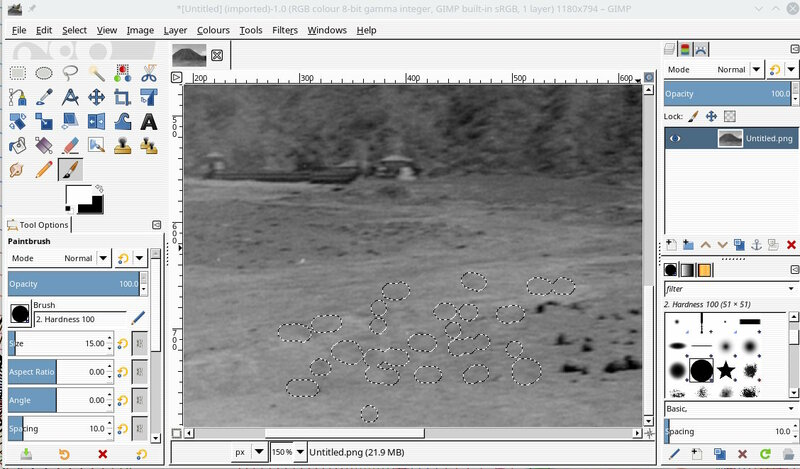 While zooming into the photo, noted that are many white dots, dirt like particles, here and there. Maybe due to the age of this photo. How can I remove these dots/dirt? Tried sharpening, did not help. 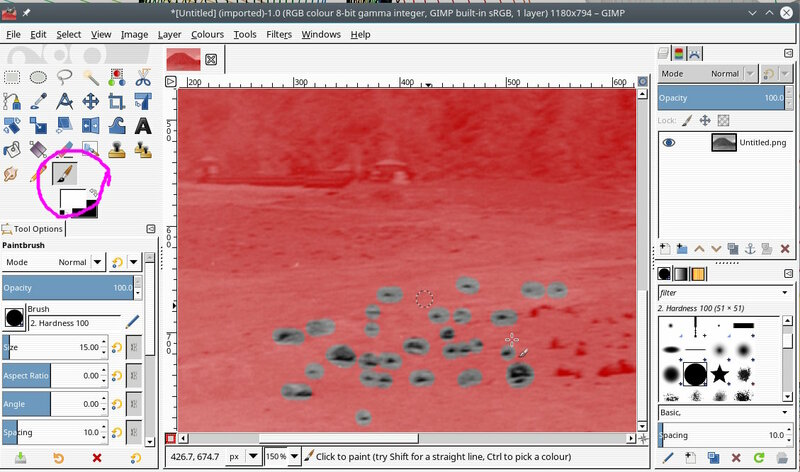 For one or two, use the clone tool and clone in from around the blemish. 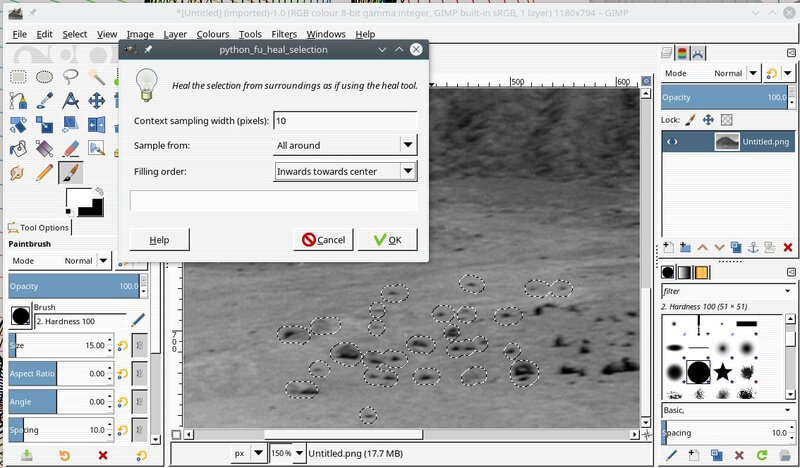 For lots of dust type dots you can use a (compiled) plugin called resynthesizer with its associated python plugin heal-selection see: https://www.gimp-forum.net/Thread-Resynt...or-Windows EDIT: I see you have already been there. Does it not work with your images? For spots on a photograph: You will have to imagine this one for the speckles. https://i.imgur.com/GKmKI1V.jpg While it is greyscale, easier to demo in RGB. (04-16-2019, 02:17 PM)rich2005 Wrote: For one or two, use the clone tool and clone in from around the blemish. Tried the resynthesizer. Took quite some time. Maybe I did something wrong, the new image does not look as good as the original, not as clear. Will try what you have suggested. Many thanks for your help. Noted that it is slower now that I have upgraded from 2.8 to 2.10 (my PC is Dell Inspiron 365 with 8 GB ram). Is that expected with 2.10 vs 2.8? Sorry for his off topic. Current time: 04-24-2019, 08:28 PM Powered By MyBB, © 2002-2019 MyBB Group.